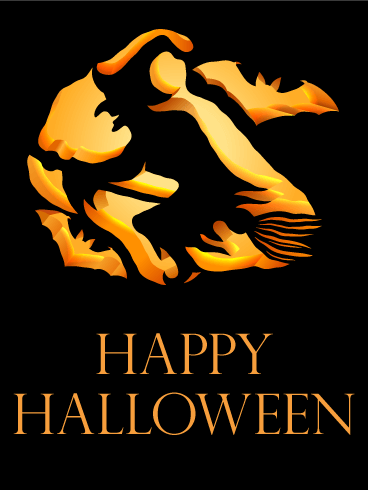 Happy Halloween - Hope you visit all your favorite haunts this Halloween for a seriously spooky night! Enjoy! 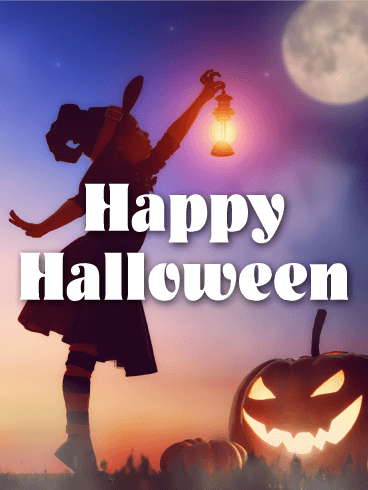 This fantastic Halloween card wishes your recipient a Happy Halloween with many of the mysterious and supernatural images this holiday has to offer! Spooky carved pumpkins hand from and line up in front of an old twisted tree, while bats circle above against the backdrop of a huge glowing moon. A cemetery and haunted castle in the background add to the scary mood. 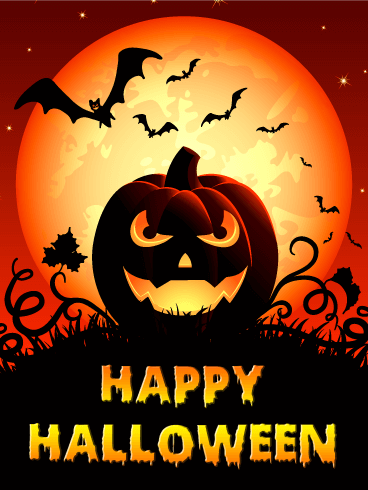 Send this Halloween card if you want to give your friends and family a few goosebumps! A charming little girl reaches up to place a lantern in order to brighten the coming night. A traditional carved jack-o-lantern stands guard as the last rays of sunset fall and a beautiful fall moon rises. 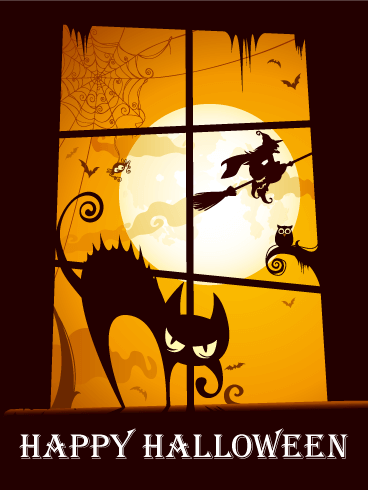 This lovely Halloween card would be a treat for any recipients. What frightening witches' brew is boiling in this glowing jack-o-lantern cauldron? We'll never tell! 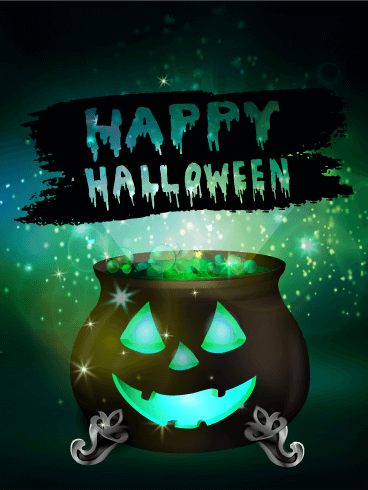 But the glowing green light, the stars and bubbles tell us something magical is afoot on this awesome Halloween card! 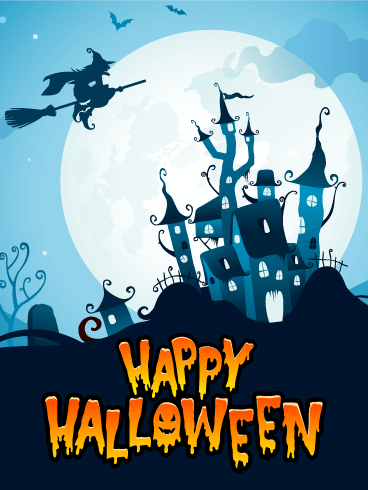 This Halloween card is a great choice for remembering the holiday to you friends or co-workers. A happy, jagged-tooth pumpkin stops by to wish your recipient a happy Halloween! Wearing a jaunty purple and black witch's hat, he presents quite a cheerful picture. 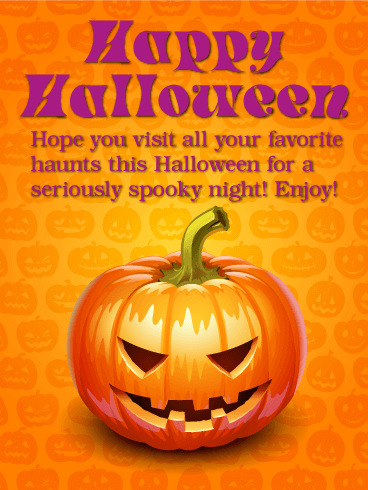 Even the orange background of this Halloween card is subtly filled with images of the holiday. This is a great Halloween card for any recipient. Yellow lights glow from within a mysterious cathedral, as a yellow moon shines in a purple sky and bats flap their wings above. What's happening inside? 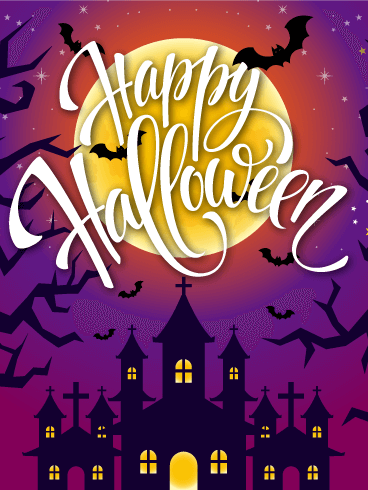 No one can tell, but this beautiful and colorful Halloween card will add an air of fantasy to your holiday message! 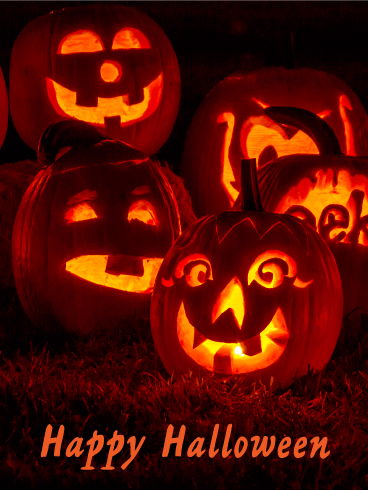 In this photo-realistic Halloween card, five friendly jack-o-lanterns shine their warm light in an open patch of grass. The orange and yellow tones of this card create a welcoming feeling. This attractive Halloween card is perfect for anyone on your list. Yikes! These creepy jack-o-lanterns might make kids want to stay away from your porch, but they're just what you need to send a spooky Happy Halloween message! 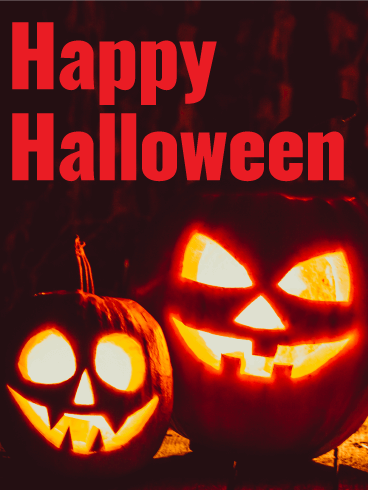 Red and black are the featured colors on this Halloween card, increasing the eerie feeling. If you were a witch, what would you want your home to look like? Why, just like the gnarled and creepy castle on this Halloween card! Perched on a black hillside, this spooky blue witch's castle is the perfect retreat for Madame Witch. 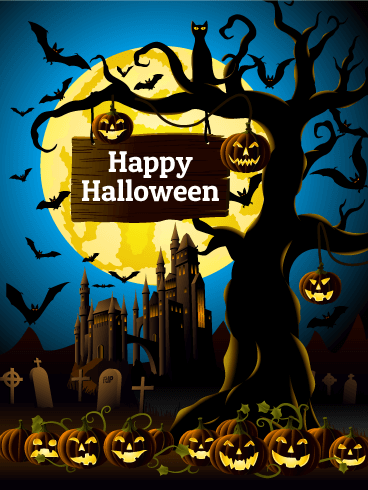 And this Halloween card will be the perfect way for you to wish your family and friends a Happy Halloween. 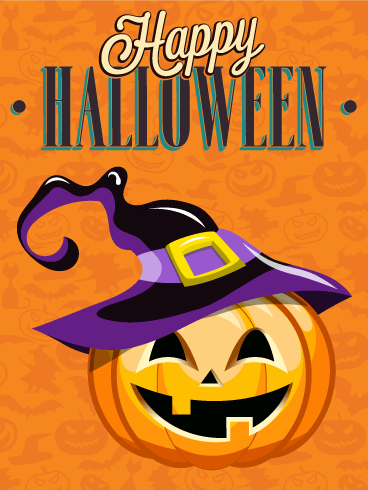 This cute Halloween card features a carved pumpkin sporting a crooked black witch's hat. The Happy Halloween message takes center stage. Surprise your friends and family with this charming Halloween card. 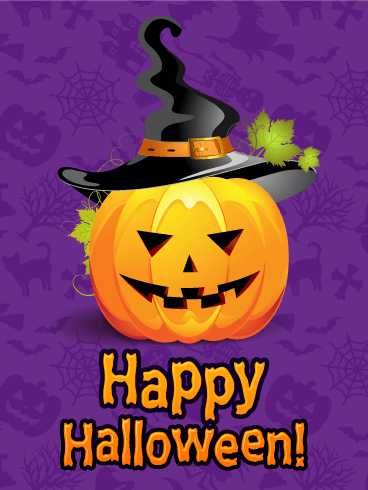 Send this Halloween card to celebrate the most fun holiday!